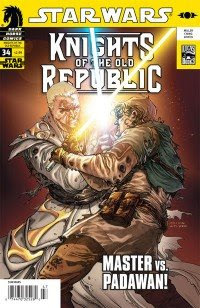 Faraway Press: The Online Home of John Jackson Miller: KOTOR #34: Secrets revealed! How're you going to top this in the conclusion? Great action, great character stuff, great reveals. It's awesome to see threads that have been in play for three years paying off. You're welcome, George! Glad you liked it. Fantastic work; hit it out of the park. I'm with george, though, and thoroughly unsure how you're going to pull off something more for the conclusion. Glad to see you found your way here, Master Keralys! I'm still getting used to the Blogger interface -- it's almost like having two different websites -- but so far it seems to be working better than the set-up I had. I hope to be blogging more frequently as a result.